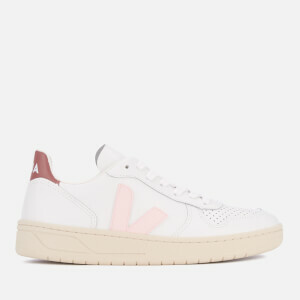 The Veja 'V-12' low top trainers are made from ecological and sustainable materials to create a positive impact. Utilising leather and wild Amazonian rubber, the sneakers feature a rounded toe, three Velcro strap fastening and branded tongue. Detailed with contrast 'V' logo to both sides in wild rubber. Finished with contrast branded panel to the heel. Set upon a wild rubber sole. Upper: Leather. Lining: Textile. Sole: Wild Rubber.